On the cover of Living Anarchism, the publishers, AK Press, point out that the anarchist movement in Spain in the lead up to the revolution in 1936-37 was the ‘the largest anti-authoritarian movement’ ever created in the world. It numbered in the hundreds of thousands and resulted from a conscious and deliberate intervention by anarchists in the everyday world of work and community. Anarchists sought to build a new world in the shell of the old and they were surprisingly successful in significant ways. Living Anarchism is testimony to this. 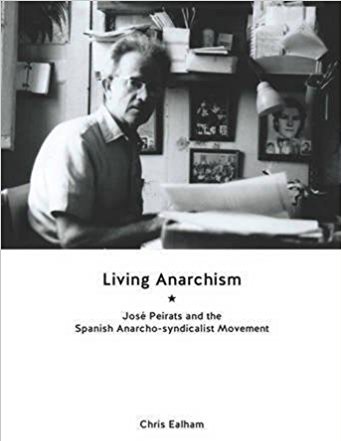 Not a history of Spanish anarchism as such, it is nonetheless a window into the life of that movement seen through the life of one its key activist, José Peirats. Living Anarchism is broken into ten sections (if one includes the excellent summation) which can broadly be divided into two parts – the period leading up to the revolution and period after the revolution’s defeat. If the first section of the book is then a celebration of what anarchism was capable of building when its activists put their minds to it, then the second section is, in contrast, the tragedy of defeat at the hands of fascism and what that came to mean. Exiled to South America and later France, Peirats struggled like many of his comrades to make sense of the defeat that had befallen the anarchist movement in Spain. Defeat is never easy and the tragedy was compounded by exile and isolation. A movement of Spanish anarchists abroad came into being but it was riven with division and acrimony. Peirats, more than most, understood the dilemma: the past could not be ignored and yet the movement, if it was to survive and rebuild, needed to move on too. It was a delicate and difficult line to walk along. Peirats was clearly a product of the university of the class struggle and his early years and reputation as a resolute union activist in the cauldron of Barcelona was something that he never departed from. However, another side to the activist was his strong interest in the practice and spirit of anti-authoritarianism. A significant part of his life – perhaps deriving from his own early exposure to the rationalist/free school movement in Barcelona – involved a commitment to the ‘athenaeum’: essentially self-organised community centres envisaged as ‘a focal point of social ferment’ for the locality around it. These centres hosted a library, debates, music recitals, evening classes and threatre productions. Before and during the revolution, as well as afterwards in exile, it was this activity surrounding the ‘athenaeum’ that Peirats returned to and was involved with again and again. Although the person who emerges from his book appears exceptional in many respects, Peirats would have been the first to dispute this, it seems. Describing himself at one point as a ‘worker ant’ he believed himself to be very much a part and a product of the CNT. Clearly he was a talented activist, writer and organiser, but there emerges from this biography a man whose dedication to revolutionary change was absolute. By no means without faults – and this is explored in Living Anarchism – Peirats nevertheless had an abiding grasp of the importance and value of anarchist ideas. Given that he had witnessed the highest point of achievement and an avalanche of low points in its aftermath, he remained largely upbeat, understating near the end, ‘I did what I could despite many obstacles’. In terms of Spanish anarchism we hear a great deal about people like Durruti but activists like Jose Peirats, it seems to me, were a lot closer to the soul of Spanish anarchism. For Peirats anarchism was about democracy, education and the class struggle. In contrast Durruti was far more liable to be off taking a pot shot at some bishop or other – a headline grabbing activity but not necessarily as productive as it sounds or looks. In 2010, the historian Chris Ealham produced what is undoubtedly one of the best social and political histories of anarchism, namely Anarchism and the City – the story of the rise of anarchism in the Catalonia port city of Barcelona. Now with this account of Peirat’s life he had done us a further service. He admits at the outset that ‘there are many aspects of Peirats life that he finds admirable’ and while this must certainly colour this work, it does not distract from what is a clear and concise account of an anarchist activist’s lived life in revolution and defeat. Matters have moved on hugely since the revolution in Spain in 1936-37 and Peirats as much as anyone saw this in full measure by the time his life came to an end in 1989. However there is a great deal to learn from this book. The Spanish anarchists combined a practice of militant class struggle with a broad visionary belief in human desire and emancipation. Whatever about claims, dreams and aspirations, in the end it takes people to make politics happen: Peirats was clearly one of those who excelled at this task. A book to read and treasure.